The “Ferme Robert” is located near the village of Noiraigue in the Val de Travers in the canton of Neuchâtel. See map on map.geo.admin.ch. From Neuchâtel, regional trains run daily to Noiraigue (see SBB website). Journey time: approx. 20 minutes. From Noiraigue, you can reach the Ferme Robert by walk in about 50 minutes. The itinerary is marked with the yellow signs “pedestrian tourism”. 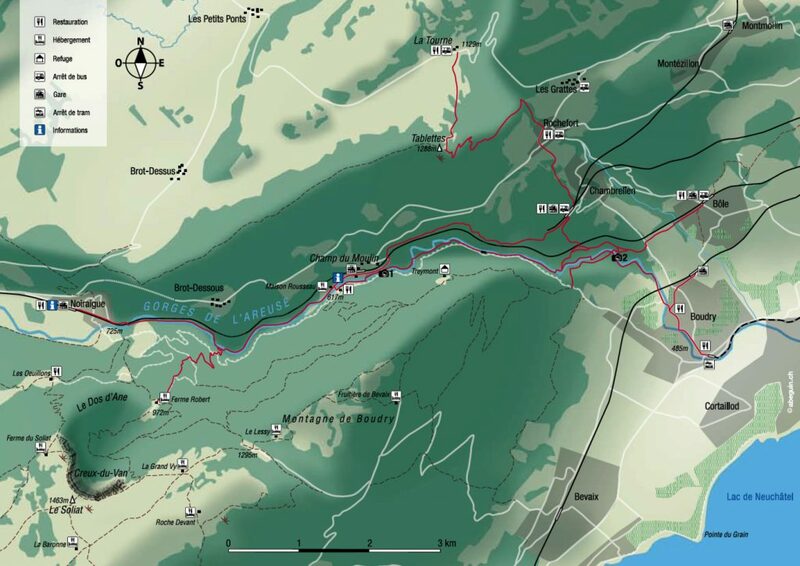 From Neuchâtel, follow Peseux and take the road N10 towards Val-de-Travers until Noiraigue (about 25 minutes). On the railway station, take on the right and follow the “Rue des Tilleuls”. At the end of the street, take on the right and follow the white signs “Ferme Robert”. After the crossing the railway, the road turns to the left and then crosses the river Areuse and then begins the ascent to Ferme Robert. From Noiraigue, it takes about 10 minutes to Ferme Robert. From the railway station of Noiraigue to Ferme Robert, the distance is about 2.5 km for a drop of some 250 m. It takes 45 minutes to an hour to reach La Ferme Robert. La Ferme Robert is at the heart of many hiking trails (Neuchâtel Rando). Share the post "How to reach us"